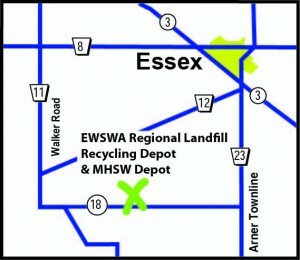 There are three MHSW Depots in Windsor / Essex County. 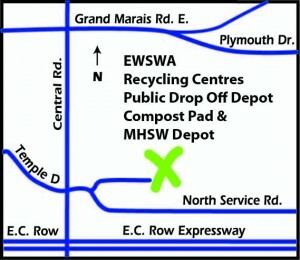 One is in Windsor (Public Drop Off Depot) and the second facility is in Kingsville (Transfer Station #2) and the third is located at the Regional Landfill. 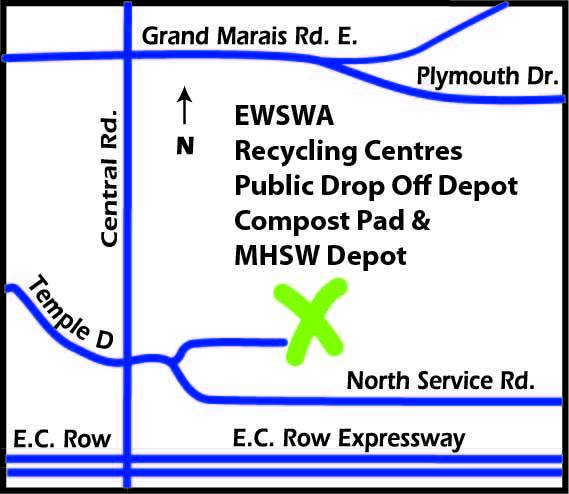 Residents can drop off any ‘municipal hazardous’ or ‘special waste’ (MHSW) at any one of these facilities FREE of charge. Small business can drop off MHSW at the facility by appointment only – tipping fees will apply. Call 1-800-265-9625 to make an appointment. DEC, JAN, FEB and MAR. Mon. – Fri.: 8:30 a.m. – 4:15 p.m.
Mon. – Fri.: 8:00 a.m. – 4:45 p.m.
Saturdays: 8:00 a.m. – 1:45 p.m.
Mon. to Fri.: 9:00 a.m. to 4:45 p.m. Many commonly used products that we encounter DAILY in our homes are considered very toxic to our ecosystem when they are disposed of improperly – for example household cleaners, paints, pesticides, etc. These products are known as ‘municipal hazardous’ or ‘special waste’ – MHSW. Not only are they hazardous to the environment, but they also pose significant risk to humans and wildlife. It is extremely important for all homeowners to remember that once they are finished with a household chemical product, the “leftover or unused portion” should NEVER be thrown in the garbage, poured down the kitchen sink or a neighbourhood storm drain. Please consider carefully the products you are purchasing. It is preferable to buy “environmentally-friendly’ products or use safer alternatives. If you have to purchase chemical products, please use them up completely, or drop off the unused portion at one of our MHSW Depots. There is no charge for this service – we will dispose of the hazardous materials in the proper manner. Remember to employ the BUD principle: Buy only what you need; Use it all up; Dispose of any leftovers in the proper manner.